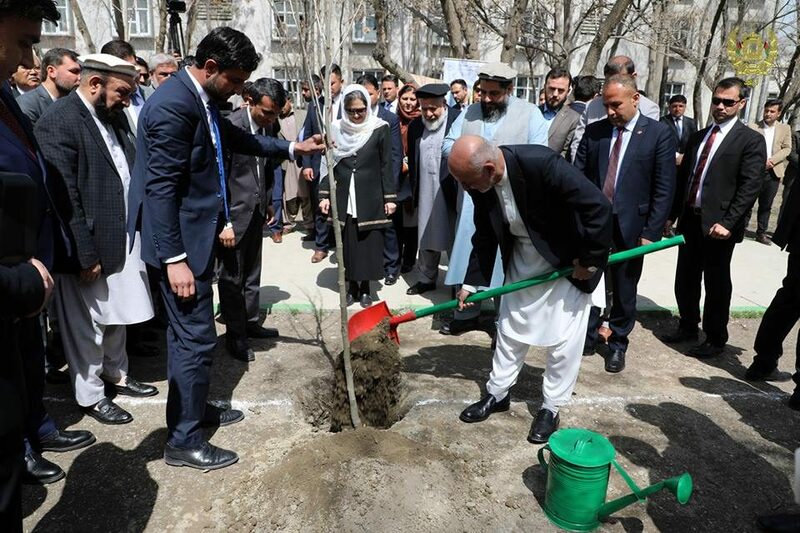 KABUL: President Mohammad Ashraf Ghani by planting a sapling at Amani High School opened CRIDA campaign titled ‘tree of peace’ yesterday in Kabul. In a ceremony held on this occasion by Capital Region Independent Development Authority (CRIDA) and attended also by the country’s First Lady, President Ghani while congratulating the New Year said besides financial and human losses in past years, the country’s forests have faced damages and harms. “Environmental protection, revival of forests, pastures and natural investments should be key goals of education and the government,” President Ghani said, adding such works are not only the duty of ministry of agriculture, irrigation and livestock, but the works of all government institutions. Praising the CRIDA officials for kicking off the campaign, the country’s President asserted that planting saplings should be conducted in all 34 provinces of the country. President Ghani instructed officials of ministries of education and higher education to further work for greenery of universities and schools, saying that planting each single sapling was a big step towards cleansing the environment and both planting and protection of saplings were important. Pointing to recent rainfalls in the country, the country’s President said it was needed to effectively make use of the country’s water and pay attention to cultivation and agriculture. Afterwards, head of CRIDA Abdul Sami Stanekzai spoke and said that it was determined that 100,000 saplings were to be planted this year, adding that the number would reach to 5 million in coming five years.